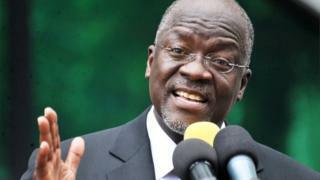 The president of Tanzania has called for prisoners to be made to work long hours, and to be punished if they are lazy. John Magufuli was speaking at the inauguration of a new prisons chief. Rights groups have accused him of growing intolerance. Mr Magufuli has lost his initial huge popularity by clamping down on the media, targeting opposition politicians and calling for pregnant schoolgirls to be banned from school. He said inmates should grow their own food in prison fields. "It is a shame for the country to continue to feed prisoners. All the prisons have fields, inmates must cultivate them," he said. "Some prison staff don't have homes. Make the prisoners work, let them make bricks day and night. If they show laziness, kick them. You have labourers, and for free," he added. He also called for conjugal visits to be stopped. "A man is in prison, leaving his wife outside, and a prison official receives this woman and authorises the prisoner to do things he is not supposed to do during his detention. I don't want to hear talk of that anymore," he said. Mr Magufuli said the underemployment of inmates led to drug use and homosexuality in jails. "I don't want to hear about this. I want reforms in the management of prisons," he said. The leader, whose nickname is The Bulldozer, has been accused by detractors of becoming increasingly authoritarian - a charge he denies.